Thank you for this review. It was lovely to read and also nice to learn a little about you! The Guerlain sounds like an amazing scent memory, to have held so vividly for so long. I have not experienced many Caron perfumes but now I am intrigued by what you wrote about this one. Years ago, I grew sweet peas in my garden. They were beautiful but I don't recall the scent...perhaps I should try growing some again. That is really nice review. Not being a Guerlain fan (ducks and cautiously looks around) I still enjoyed reading the review. Alena, thank you. That is a beautifully conceived and written review; many thanks Alena. 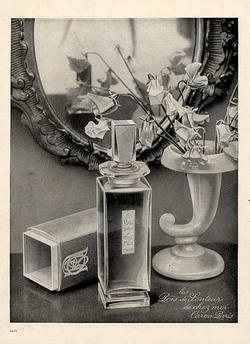 I especially enjoyed the idea that this perfume does not return you to the past, but 'stops the marathon of the days for a bit ... '. The vintage ad is gorgeous too. So simple and gentle. I feel like I have lots to think about now. That's a nice idea to start growing sweet peas, though as far as I know it is quite "capricious". Undina, I'll risk to suppose (ducks and cautiously looks around) that you would like Pois de Senteur from Guerlain. When I'm wearing vintage or classical perfumes, I feel they fit into the moment much more than most of latest ones. Alena, thank you for this beautiful and very thoughtful review. I have always wanted to try this perfume, now I want it even more! Lovely reviews - more temptation! I shall bury my nose in some colourful sweet peas and enjoy their "light, laughing scent" - beautifully summed up. I hope the perfume will fulfill your expectations! I would also very much like to do the same thing – haven't smell the real sweet pea for years!